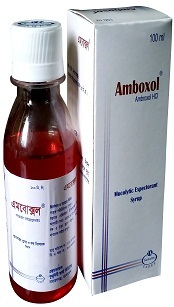 Amboxol 100ml Syrup Each 5ml of syrup contains 15 mg Ambroxol hydrochloride BP. Amboxol Paediatric Drops Each ml of drop contains 6 mg Ambroxol hydrochloride BP. Ambroxol is a mucolytic agent used in the treatment of respiratory disorders associated with viscid or excessive mucus. Ambroxol is the active metabolite of bromhexine and this metabolite possesses a greater bronchosecretolytic effect than bromhexine. 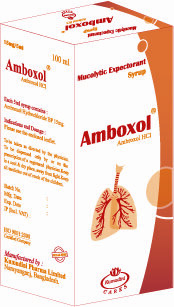 Ambroxol improves sputum rheology by hydrating mechanism leading to liquefication of mucus in the lumen of respiratory tract, thus facilitating expectoration of mucus and reducing dyspnea. It stimulates production of phospholipids of surfactant by alveolar cells, thus contributing to the lowering of superficial tension in the alveoli. It also reduces bronchial hyperactivity. Ambroxol has anti-inflammatory properties owing to the inhibitory effect on the production of cellular cytokines and arachidonic acid metabolites. In patients with COPD it traditionally improves airway patency. Gastrointestinal side effects like epigastric pain, stomach overfills feeling may occur occasionally. Rarely allergic responses such as eruption, urticaria or angioneurotic edema has been reported. Amboxol should not be taken simultaneously with antitussives (e.g. Codeine) because phlegm, which has been liquefied by Ambroxol might not be expectorated. Protect from direct light exposure. Store in dry place at a temperature not exceeding 30 C. Keep out of the reach of children.